Actually, I could have called this installment “The Little Camera that Could” in honor of the star of my Saturday night show, the ZWO ASI120MC, one of the new astro cameras out of China that are taking the planetary imaging world by storm. The inexpensive ZWOs with their small chips and many small pixels are perfect for high-resolution imaging of the Sun, Moon, and planets, but that’s not all they can do, muchachos. I haven’t tried the camera on the deep sky (yet), but I have been amazed at what folks have accomplished there despite the ZWOs’ little chips and lack of cooling (I understand a cooled ZWO is planned). No, you can’t capture huge swathes of space, but the little cams have produced surprisingly good pictures of planetary nebulae, galaxies, and globular clusters. I hadn't used the ASI for anything but the Moon until recently, when I did a few shots of the Sol with my friend Jonathan’s Coronado solar scope at the just finished Deep South Regional Star Gaze. I’d heard rumors that the ZWO cameras didn't work well with a hydrogen alpha scope, but considering the images I got with my color camera on my first attempt with Hα, I gotta rule that talk bull-spit (this is a family friendly blog, y’all). As they say on the pea-picking TBS late at night, though, “THAT’S NOT ALL!” I’ve also used the ASI120MC for spectroscopy. With the aid of the program RSpec, which I’ve been testing, and a Star Anlyser grating, I was able to easily—yes, easily—capture a detailed spectrum of Vega. Unfortunately, that was my first outing with the spectroscopy set up, and I didn't have things set up quite right. A quick consultation with RSpec’s helpful (and talented) author, Tom Field, edumacated ol’ Unk as to where he’d fouled up. So, I was anxious to give Vega another try, and last Saturday night seemed like a good time to do it. There’d be a near First Quarter Moon in the sky, not a very good time to go after galaxies, but Luna wouldn’t prevent me from taking Vega’s spectrum. And I could combine that with shooting some more images for my Destination Moon project. I’d barely scratched the surface of the 300 lunar features I’ve set as my imaging goal for the DM project, and needed to get back after it. I was still a wee bit weary from the exertions involved in packing for, attending, observing at, and returning from a major star party the previous week, y’all. But so what? I’m retired now, and I got to thinking I ought to be doing a lot more observing than I am. The big old oak trees that surround and envelop Chaos Manor South don’t allow me to do much from home, but the Possum Swamp Astronomical Society dark site is only 45-minutes away, and I now have the one thing I lacked for the previous three decades: time. That’s just what I’d do on this weekend, I thought: spend the early evening at the dark site imaging my silv’ry girl, Diana, and when she began to sink I’d switch over to spectroscopy and get Vega and maybe a few more stars besides. I’d be able to use the ZWO for both purposes, wouldn’t need too much gear, and I’d be able to make it a reasonably early evening now that that fricking-fraking Daylight Savings Time is done. Saturday started out with a beautifully blue sky, but the weather-saps insisted clouds were on their way, and I had the feeling they were correct for once. The formerly cool (for us) temperatures were spiking back up into the 80s, and the humidity was rising. As the day wore on, the skies remained mostly clear, but there was a line of stuff low on the western horizon, never a good sign, and I began to wonder whether I would be able to beat the advancing front. At four o’clock it wasn’t raining, at least, and I stuck to my maxim, “If it ain’t raining, head to the dark site.” At least I didn’t have too much to pack, not compared to a Mallincam run: Mrs. Peel the Edge 800 SCT, the VX mount, the tackle box that holds most of my accessories, and one large Tupperware container with the rest of the astro-junk. The imaging gear consisted of the ZWO and accessories in an aluminum tool attaché case I got from the cotton-picking Harbor Freight, and my Toshiba Satellite laptop. With sundown coming at quarter after five, I hit the road at 4:30. The farther west I went, the higher those damned old clouds climbed. By the time I was out of the city, there was a substantial bank of thick gray suckers in the southwest. Y’all will be proud of me that I didn't even consider turning Miss Van Pelt around. I continued on to the PSAS field and got to work setting up—in a right big hurry. Looking at the reddening western sky, which seemed to give the lie to “red sky at night, sailor’s delight,” I estimated I might have an hour at best, so there was no time to lose. Old Unk scurried, campers, scurried. I originally planned to do a good rough—through the hollow polar bore of the VX—alignment on Polaris, which would be followed by a full six star go-to alignment and an AllStar polar align. But Polaris was not visible yet, and when it got dark enough to see the North Star, I was purty sure it would be behind the clouds. Since I couldn't see Polaris, I used my compass to get the mount’s azimuth as close to that of the North Celestial Pole as I could. We are lucky down here that magnetic declination (deviation) is small, so a compass can get you close. The mount’s R.A. axis elevation was still set for the Feliciana Retreat Center, and I left it alone, since FRC is just a smidge north of the PSAS dark site in latitude. That was the extent of my polar alignment. Now came mount go-to alignment. I’d left the NexRemote cables, game pad, and game pad receiver at home, since I knew I wouldn’t want to devote time to setting all that up with weather on the way. Y’all know I ain’t a fan of the Celestron Plus hand control that came with the VX mount, but all I’d be doing with it would be a simple Solar System Align and aiming at targets with the direction buttons. Lit off the mount, entered time and date and such, and selected Solar System Align from the menu. Chose “Moon,” and the mount and Mrs. Peel slewed that-a-way. I was surprised they stopped as close to Luna as they did—maybe a half degree away. I suppose the fact that I’d used exact time off’n my iPhone helped a little. If the sky cleared or the clouds stopped in their tracks and I had the chance to do some spectroscopy, I’d bite the bullet and do a 2 + 4 go-to alignment and an AllStar polar alignment before I got started with that. From the way the evil dark things were flooding the sky from the west, I didn’t reckon I’d have to worry about that, howsomeever. The clouds apparently kept my fellow PSASers at home. I was alone, and while I have been known to get spooked at this slightly lonely airstrip, I was perfectly comfortable all by myself on this night. I was way too busy to worry about the depredations of the dadgum Skunk Ape and his despicable pals, Mothman and the Little Grey Dudes from Zeta Reticuli 2. I will admit I left the runway lights on, but why not? I was imaging the Moon and wouldn’t need a bit of dark adaptation. With scope more or less aligned, it was time to get the rear cell setup done. When I am imaging the Moon and planets at high magnification, I always use a flip mirror. My first experiments with video back in the early 90s, which involved an ancient Sony camera with a vidicon tube, revealed that even with a precisely aligned finder it’s near impossible to get even the Moon on a small video camera chip without major exertions. Flip mirror on Mrs. Peel’s (ahem) rear, and 12mm reticle eyepiece in the flip mirror focuser, it was time to set up the cam. We used to use eyepiece projection to get long focal lengths for Lunar and planetary work, but that has gone the way of the dodo. Barlow projection provides much better images, and with today’s small chip planetary cams, you don’t need the huge focal lengths provided by eyepiece projection. How much focal length would I need? I like to shoot the Moon at about f/30, but what I’d seen through the eyepiece in the course of getting the mount aligned showed that would be too much on a night where the seeing started out bad and would undoubtedly get worse. A 2x Shorty Barlow (Orion) went in the flip mirror’s 1.25-inch rear port rather than my 3x APO Owl Astronomy Barlow, and the ASI120MC went into the Barlow via its 1.25-inch nosepiece. One other thing you will need in addition to a flip mirror and a Barlow for Lunar imaging with the color ZWO is an IR block filter. Imaging chips are very sensitive at the infrared end of the spectrum, so you’ll usually want to block most of that. If you don’t, your pictures will have a strong red/pink cast that it difficult to correct during processing. If you buy a color ZWO camera, you’ll find the maker has thoughtfully included a 1.25-inch IR filter that screws onto the camera’s nosepiece. You need a software program to run the camera and handle image capture, of course, just like with any other astronomical cam. When I first got the camera, I started out with the freeware program Sharpcap. It works very well with the ZWO, and is simple and effective. I’d still be using it today if I hadn’t discovered another freeware soft, Firecapture. Firecapture has nothing to do with the old Firewire data format; it is a program designed to control astronomical cameras, especially for Solar System imaging, and, frankly, campers, does more than I will ever call upon it to do. Not only will it control filter wheels and motorized focusers as well as cameras (a large selection of cameras), it will even calculate ephemerides of Solar System objects. Best of all, it is easy to use. Only caveat? If you want to use Firecapture with a ZWO camera, make sure you download and install the v2.3 beta. Earlier releases tended to lock up with the ZWO cams. Camera and software ready, I went back to the eyepiece, centered a target feature on the 6-day old Moon, the complex and interesting crater Maurolycus, flipped the flip mirror up to send light to the camera, went back to the Toshiba, and saw...absolutely nuttin’. Oh, for god’s sake. What now? I didn't need this with weather coming in. I managed to keep my cool somehow, and it turned out all I had to do to get the crater in view was tweak exposure and gain, which were still set for imaging through the solar scope. The live image, the video (like other planetary cams, the ZWOs output a .avi video stream), of Maurolycus looked OK, especially after I fine-tuned focus, but just OK. The seeing was even worse than it had been when I’d aligned the scope, but it’s amazing what Registax 6 can do, so I fired off several 25-second sequences anyhow. That yielded around 800 individual frames even at max resolution, 1280 x 960, and that is usually more than enough frames for a high resolution lunar image. 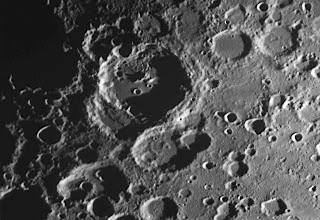 Maurolycus has always been one of my go-to lunar features. It’s big, 114 km in diameter, and, while it is located smack in the Moon’s southern highlands, it is far enough from the limb to look round. Though it was formed purty far back, during the Nectarian period about 3.9-billion years ago, it has a fresh, deep look. At this point in the lunation, the nearby large crater Barocius, which can look soft when the Sun is higher, also stood out well. 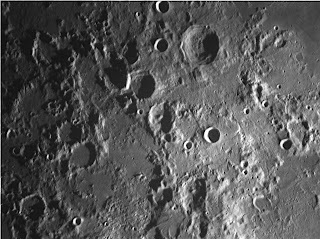 This was hardly the first time I’d imaged Maurolycus; I took quite a few shots of it with my old SAC 7B modified webcam. This crater always looks good; surrounded by large amounts of detail, it gives your images a “high resolution” look, even if they are actually a little soft. Next up was one of the most photogenic features on the Moon, the crater trio of Theophilus, Cyrillus, and Catharina. I chose to concentrate on Theophillus, cutting off part of Catharina. While all three look good together, Cyrillus and Catharina look old and fuzzy. Theophilus is sharp and just loaded with detail including an exquisite central peak complex. This big 101 km diameter crater is likely fairly young, probably dating from the Eratosthenian period about 1 – 3-billion years ago. 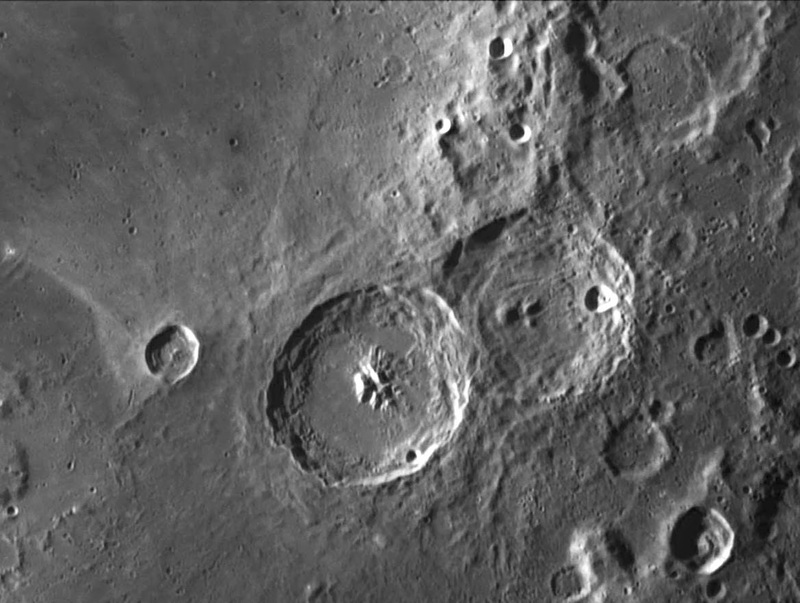 When the seeing is better than it was on this evening, it’s easy to capture lots of small detail including rilles and countless craterlets. 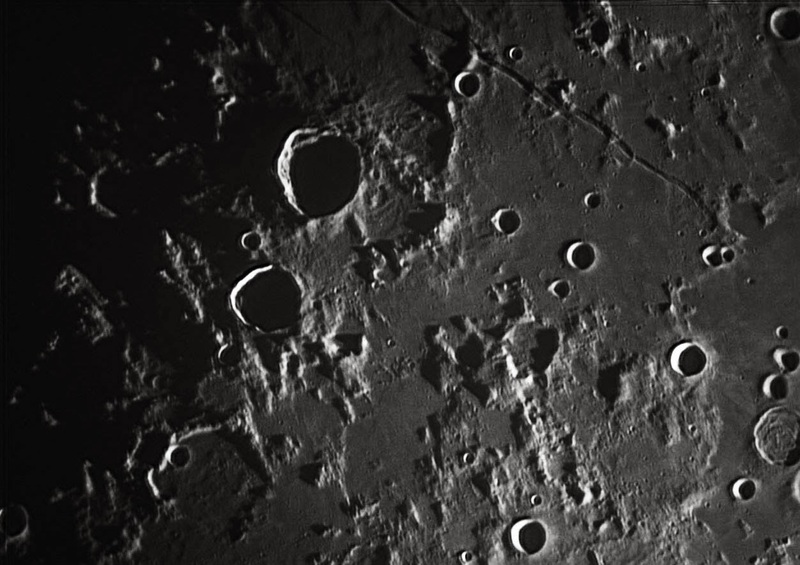 Agrippa and Godin, a pair of craters not far from the shores of Mare Vaporum, are usually fairly uninteresting. Both appear round and deep with Agrippa being 46 km across and Godin about half that size at 21 km. While their floors are fairly detailed when visible, neither is really much to write home about. The real scenic landmark to visit here is the wide rille just to the north of the craters, Rima Ariadaeus, a graben, an area where the ground has slumped, which runs east/west for some 220km. This whole area is a welter of rilles, small craters, and ghost craters. I thought even normally staid Agrippa and Godin looked very photogenic on this night with their floors still covered in inky black shadow. 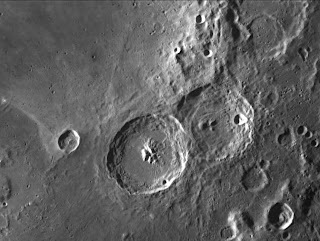 Delambre, a medium sized 53 km crater sitting near the edge of Mare Tranquilitatus, is not one I remembered, though I’m sure I must have observed it numerous times over the years. 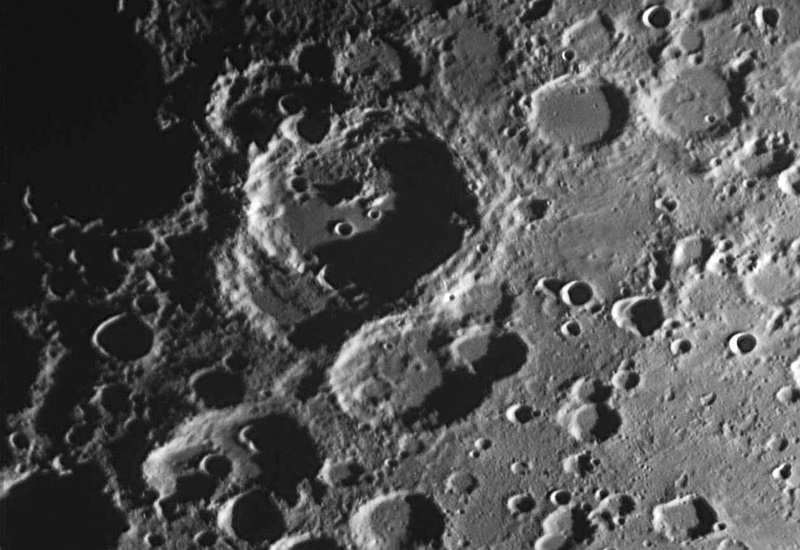 This is a nice region, with a crowd of craters large and small, and certainly deserves a look. The main interest at Delambre is its rough looking floor, which I suspect on a good night would give up some craterlets, and the crater’s beautiful terraced walls. With conditions worsening by the minute, I wasn’t sure whether or not I’d get an acceptable image of Plinius. 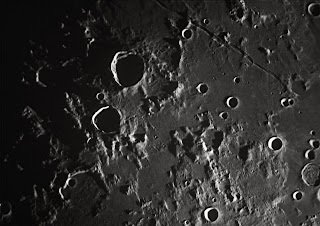 I did, but just barely, and may revisit this Eratosthenian crater on a better night. It deserves it. This fresh appearing 43 km formation stands out since it is offshore out in Mare Tranquilitatus near a cape, Promintorium Archerusia. 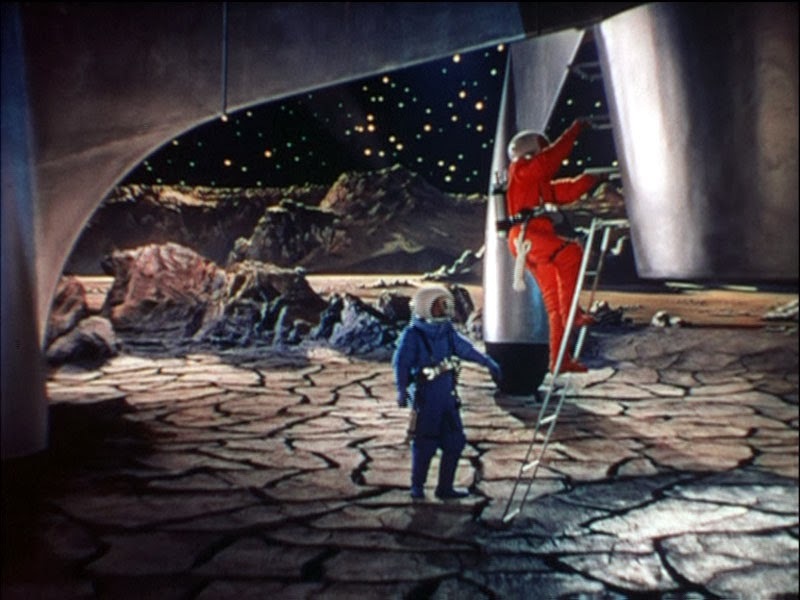 Of particular interest are the crater’s detail laden floor and a complicated-looking central peak. When I had Plinius in the can, a look up showed Luna was soon to be bathed in clouds, and was already covered by a thin layer of haze. Actually, it seemed as if Diana might skirt the cloud-bank for a while, but the haze and the seeing near it were so bad, and the last exposure of Plinius so soft, that it was obviously time to pull the Big Switch. It didn’t look like rain was imminent, but it didn't look out of the question, either, so I didn't tarry. From the time I’d mashed Firecapture’s record button on Maurolycus, I’d had little more than half an hour of imaging, so I was back at good, old Chaos Manor South and sitting in the den with a big libation of the pea-picking Rebel Yell at 9 in the freaking p.m. Just in time for my fave Saturday night show, Svengoolie. Unfortunately, the film he was showing was Ghost of Frankenstein, my least favorite among the Universal monster movies. Frankenstein’s Monster on the witness stand in a brightly lit courtroom? Reeeeee-diculous, y’all. Svengoolie purty much a bust, and it still early, I couldn’t resist sitting down to the Toshiba Satellite and test-processing one of the sequences of Maurolycus with Registax 6. If you’ve used the previous versions of the premier image stacking program for planetary observers, the new one, 6, won’t hold too many surprises. Some new options have been added, especially to the wavelets screen, but nothing that should bring you up real short. If you are new to Registax? This tutorial by Paul Maxson does the best job I’ve seen of getting you started simply and quickly. If you are new to Firecapture and are using a color camera like the ASI120MC, there is one thing to get used to. You need to debayer your sequences before you process them with Registax; you have to convert the camera’s raw video to RGB color. You can allow Firecapture to do that on the fly as you image, but that causes a fair amount of processing overhead and usually results in lower frame rates. Firecapture comes with a little app that will allow you to debayer sequences in batches or singly after the fact, and that is what I do. I also often convert my final images to black and white. I just prefer monochrome for the Moon. After I’ve stacked in Registax and sharpened the resulting still image with its amazing wavelet filters, I normally do a little fine-tuning. Registax has its own image processing tools, but I find it easier to use Adobe Photoshop or, increasingly, Adobe Lightroom. I began using Lightroom to process and organize the terrestrial images I shoot for my books and magazine articles, and find nearly as powerful as Photoshop and much better than Photoshop’s “Browse” function at keeping my hundreds and hundreds of pictures organized. Lightroom is much less expensive than Photoshop, a measly 149 bucks for the downloadable version vice 650 smackers for Photoshop. For most imagers, Adobe Lightroom is more than capable enough, and for working photographers it actually has some advantages over Big Bro. So what did I think of my latest batch of Moon pictures when I'd Registaxed 'em all the next day? As you can see above, not bad, not bad at all—considering the conditions. If nuttin’ else, muchachos, it showed, once again, that you will always get more out on the observing field than you will sitting in front of the dadburned boobtube. Okay, where was we, muchachos? I’d just finished the third night of the 2013 Deep South Regional Star Gaze, which was the first clear night after a couple of days of stormy weather. Friday night was damp, y’all, real damp, but I got a lot accomplished. In about five hours, I did 77 Arp galaxies and 20 showpiece objects besides. When I finally drifted off in our room in the Lodge at 3:30 in the a.m., I was feeling good. I felt even better when I awoke after nine Saturday to skies that were, if anything, clearer and bluer than they had been Friday. The air was also a whole lot drier. It was slightly breezy and it felt as if the humidity had dropped by double digits. 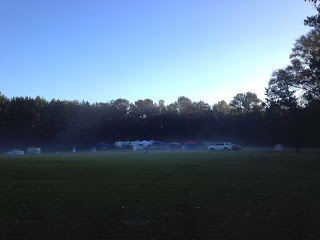 A quick run down the field before breakfast was illuminating, campers. If I hadn’t known otherwise, I’d a-thought it had rained; everything—scopes, canopies, tables—was wet. Friday night’s ground fog, the remnants of it anyhow, was still hanging on but was soon burning off and I didn't think it would put in a return appearance Saturday evening. After breakfast, where the Feliciana Retreat Center staff kicked it up yet another notch, adding pancakes to the grits, bacon, sausage, eggs, and biscuits, I had a couple of things to consider. First was what to do with myself all the livelong day. Second was what to do with the night that was coming. The former turned out not to be much of a problem. Once I was done with breakfast and had lingered over a few cups of Joe, it was near-about noontime. The second question was a bit more difficult to answer. I’d covered most of the Arp galaxies that would be well placed before the wee, wee hours, so I didn't believe I’d be able to devote a second night to Operation Arp. Originally, the plan had been to do some further testing of the remarkable Mallincam Junior Pro. I’d image some of the same objects I’d got with the Xtreme, at least the showpieces, and see how Junior stacked up against big sis. That was before Miss Dorothy won her telescope, though. 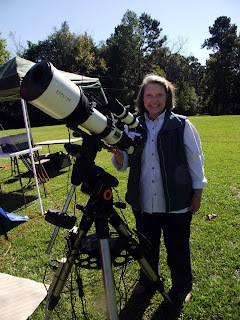 As I told y’all last week, Miss D. won a lovely new scope, an Explore Scientific AR102 refractor, at the Friday afternoon raffle. It sure looked good, but I had a powerful hankering to see how good it would be to look through, not just at. I mean, y’all, do you really think I’d let a brand new scope sit idle on a clear night? Junior would get his turn under dark skies down in Chiefland after Christmas if not before. 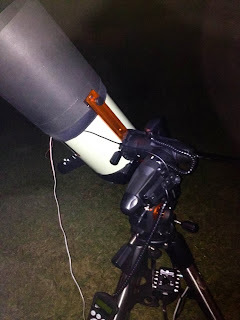 Tonight we would go visual—with a freaking refractor. As you probably know, Uncle Rod just ain’t a refractor kinda guy. Oh, I’ve got a couple of ‘em. Small ones. 80mm is the largest aperture lens-scope in my stable. And those little guys get used infrequently at best. As I have said before, Unk’s refractor-phobia had its origin in my first look through what was supposed to be the wonderscope of all wonderscopes, a Unitron. If you came of age as an amateur astronomer in the 60s or 70s, I don’t have to tell you what a Unitron was, but for you sprouts, Unitrons were gorgeous long-tubed achromatic refractors that graced the advertising pages of Sky and Telescope every single month. When the company’s Christmas ad appeared in the December 1965 issue of Sky and ‘Scope, Unk, like a thousand other space-crazy Boomer kids, couldn’t help but put a Unitron on his Christmas list. Not that I had a dog’s chance in hell of getting one. The basic Unitron, a 2.4-inch (60mm) alt-az job, went for one-hundred and twenty-five fraking dollars in the mid-60s. Which was somewhat more than the average for a week’s wages back then. At least I could dream. Unitrons were the very stuff of dreams, and I spent plenty of lazy afternoons dreaming about what I would be able to see through Unitron’s 3-inch Photo-equatorial, which was the one I really wanted. It was a Unitron, so I naturally assumed it—or even the 2.4-inch—would show far more than my 4-inch Palomar Junior Newtonian or even my “realistic” dream scope, a Criterion RV-6 Dynascope. Seemed like back then every neighborhood had a Little Rich Kid in residence. We did, and he was not a bad feller, but he and I had had a bad falling out and didn't speak much. Nevertheless, when he cajoled his old man into buying him a Unitron Model 114 alt-azimuth 60mm, I wasn’t too proud to cadge a look one night when I spied him setting up in his backyard. The first quarter Moon was up good and high, and I suppose I expected Copernicus to look like the Ranger VII pictures that had been in My Weekly Reader. Boy, would my buddies in our Backyard Astronomy Society envy me when I told ‘em I’d observed with a UNITRON. I could already see the envious look on ol’ Wayne Lee’s face. Eye to eyepiece… “Hey, why is there only one freaking focus knob?” And…and—what a disappointment. What I saw was a yellow-orange Moon that was OK, but didn't look near as sharp as it did in my Pal Junior at a similar magnification. When Bubba applied his highest power eyepiece, the lunar surface didn't rush up to meet me like I was making a descent with the Destination Moon rocketship, it mushed out. I somehow managed to force out a “Great scope!” or two and headed home to my lowly Edmund as fast as my legs would carry me. My disappointment in the little Unitron stayed with me. Now, before you refractor troops get all huffy, yes, I know a good refractor is capable of excellent performance. And a good apochromatic refractor capable of astounding things. Hell, I’ll even grant that that 60mm Unitron probably could have surprised under the right conditions in the right hands. And yet...and yet...my disappointment with that pretty little telescope stuck with me. And now a refractor had come to stay with Unk and Miss Dorothy. I had no idea what to expect. It was bigger than any refractor I’d owned. Four fraking inches, same aperture John Mallas used to make the observations for his classic 1960s columns and his book, The Messier Album. I loved and still love that book, and John M. had obviously seen a lot with a 4-inch refractor, so I’d reserve judgment on the one sitting in its box under our tailgating canopy until it was under the stars. First step was getting the newun on the mount. Shortly after D. received it, I’d checked out the dovetail sitchy-ation and had determined there’d be no problem mounting AR on VX. It came with a nice pair of rings and a Vixen compatible dovetail, and would work out of the box with the VX—if I could balance it. I’d only brought along one counterweight, one 11-pound counterweight. That’s enough to balance the C8, but I wasn’t sure about the AR102. I had almost packed a second weight, but hadn’t. Why? I had an epiphany the night before the star party: “Maybe I should bring another weight, we are gonna win that refractor. Naw, might jinx it.” Lucky guess or an instance of Unk’s POWERFUL REMOTE VIEWING SENSE? You be the judge. Turned out I needn't have worried about balance. Eased Mrs. Peel off the VX respectfully, and put the new girl in her place. At 10.4-pounds, the refractor is actually lighter than the Edge 800 (sorry Emma). She was easy to balance in declination by sliding the dovetail a little forward. I could have also moved the AR farther forward in her rings if I’d had to. To balance in R.A., I actually had to slide the counterweight slightly up the shaft from where it had been to balance the Edge. Looked like we was go. I felt a little guilty about relegating the Edge 800 to her case, since she had performed so brilliantly the night before, not just capturing the Arps, but bringing back surprising detail in ‘em. But I figgered she’d get over it. Unk had new scope fever, and the new baby’s looks were just sending his temperature ever higher. To start with, the tube was a gleaming white. I’ve loved orange, black, and blue tubes over the years, but white just seems right for a scope. My Palomar Junior’s tube is white, my RV-6’s tube is white, and now our current scopes, my Edge 800 and Dorothy’s AR102, have white tubes; it’s like a return to those thrilling days of yesteryear. I might add that the finish on the Explore Scientific is flawless and the Explore decal on the dew shield is attractive and professional looking. Ah, yes, the dewcap. That’s the one thing on the scope that makes it stand out. It is considerably larger than the dew shields on similar aperture refractors, and seems bigger than it needs to be, even given the scope’s somewhat oversize objective cell. Once I had the dew controller adjusted correctly for the night’s conditions, the larger diameter of the shield didn't seem to hurt anything, though. As my buddy Jon said, it just seems to make the scope even more impressive looking. What it actually looks a lot like is the old LXD 75 – 55 refractors from Meade. That’s okay. I always liked the cut of their jibs. Perhaps the most impressive thing about this OTA is the focuser, a hefty 2-speed Crayford in a hefty tailpiece assembly with two large and hefty (that seems to be the operative word for the AR) aluminum knobs. Looked good, but I couldn’t help being skeptical. I’ve seen plenty of focusers on import scopes that looked good, but worked bad: rough, prone to slippage, impossible to adjust correctly. Only use under the stars would tell which way this one would go. The focuser uses a compression ring impinged on by three big screws, not just setscrews, to hold the diagonal in place. Accessories? They are surprisingly lavish. There’s a 50mm finder with a gleaming white tube that sports nice dual crosshairs. The only down check with it is its mount. Oh, it’s nicely done, I reckon, but like most of those that ship with scopes these days, it uses the two-screws-and-spring-loaded-tensioner paradigm. I prefer three adjustment screws per ring, as that seems to hold alignment better. I guess this is the current fashion with Chinese scope makers. The Edge 800’s finder bracket also has a spring tensioner-thingie. Also impressive is the star diagonal I found in the box. It’s a 2-inch job, a nice HEFTY 2-inch job, marked “99% reflectivity.” It uses a compression ring to hold the eyepiece and the sides are an attractive carbon fiber material (that’s what they look like, anyhow). Finally, there is the tube rings/dovetail. Again, “hefty,” with nice oversized knobs and a precision manufactured Vixen compatible dovetail that slid into the saddle on the VX mount easily and was not too tight nor too loose. Also cool is that the “top” side of the rings opposite the dovetail is formed by a carrying handle that made it easy to get the OTA on the mount. The refractor was on the VX and looking oh-so-fine. Miss D. was thrilled to receive many admiring compliments about her pretty, new scope, and she and me could hardly wait for first light. Before that could happen, though, we had to get through the tail end of the afternoon. 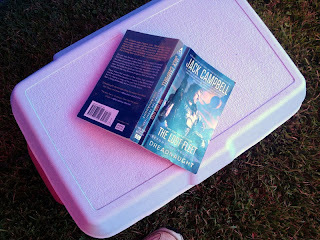 I spent a little time reading (more military SF), but the biggest event was the last raffle of the star party. Naturally, again, Unk didn’t win nuttin’, but my friend and observing companion, Jon Ellard, almost unbelievably, won the second AR102. He was just walking on air about that. Looked like it would be a dadgum refractor party on the old DSRSG observing field Saturday night! Not long after the raffle, it was time for supper. I believe my favorite on the FRC menu is the pot-roast—the menu remains purty much the same spring and fall year after year—but the brisket is a close second. Tender…smoked to perfection…excellent sides…the salad bar…gallons of that southern elixir, sweet tea. What more could a hungry hillbilly ask? Then, darkness was upon us. D. and I bundled up, since it was to be considerably colder than it had been the previous evening. 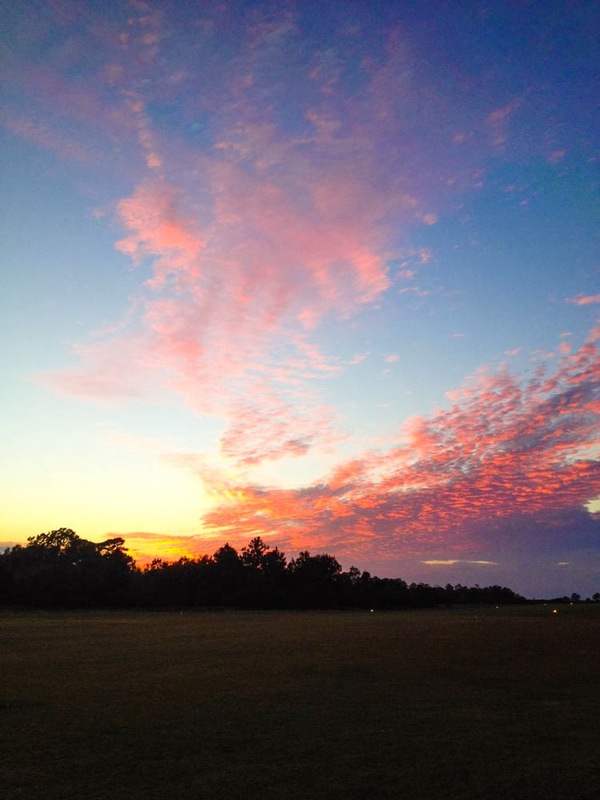 Friday, it got down to maybe the upper forties—though the humidity made it feel colder than that—on this night it was forecast to hit the upper thirties. That’s verging on “too cold” for this good old boy, especially since I’d be out under the stars at the eyepiece of Dorothy’s refractor, not under the canopy next to a heater in front of a computer and a video monitor. Anyhoo, the mount set up was exactly the same as the night before. I hadn't managed to move or bump the tripod, so I didn't have to worry about polar alignment. Since I didn't say anything about it last week, I suppose I should mention I controlled the mount with NexRemote, Celestron’s program that takes the place of the hand control. While I’d be observing visually and not sitting at the PC, I like being able to use a wireless Wingman game pad as an HC thanks to NexRemote. One less cable to get tangled up in. NR works just as well with the VX as it does with my other Celestron mounts, albeit with one hiccup. If your telescope mount features one of Celestron’s “PC” ports, there is no need to worry about the hardware hand controller at all. It can say in its case or at home. You plug the laptop directly into the PC port via Celestron’s “programming cable.” While the CG5 doesn't have a PC Port, I can provide one for it with it with their (no longer sold) Aux Port Accessory, which plugs into the hand control socket. Unfortunately, the Aux Port Accessory doesn't work with the VX. That means I have to connect NexRemote to the mount through the port on the base of the hardware hand control. You don’t have to do anything with the hardware HC; it just provides a way of connecting to the mount. Wish I didn't have to fool with it, but it is not a big deal, I reck. Soon as it was dark, I got the mount go-to aligned. That was no more difficult than it had been the previous night, or shouldn't have been. I had forgotten how much I hate using a “real” finderscope for alignments. Mrs. Peel has a Rigel Quickfinder on her, and my other most used C8, Celeste, has a Telrad. The AR102’s finder is a pretty one and the optics are good, but I find it much easier to use a zero-power job. That, combined with the fact that we were real excited and that it was just barely dark enough to see alignment stars, caused me to miss Fomalhaut when I was doing calibration stars, aligning on a nearby sparkler by mistake. I got an “align successful” message nevertheless, but the go-tos were not as good as they normally are. Nevertheless, everything I requested was in the field of the refractor using the 16-mm 100-degree Zhumell eyepiece, the Happy Hand Grenade. What was our first light target? M13, of course. Yeah, it was probably a little low here in the first week of November, and it really wasn’t dark enough, but with it in the sky, what else would we go-to first? My impression after Dorothy had had a good long first look with her new scope? How tiny the stars were. Yeah, I know, people always talk about stars being tiny in a refractor, but most of the reason for that is that stars naturally look “smaller” at the lower powers you get with a medium aperture/medium fast refractor. The AR102 is a 4-inch f/6.5, so the HHG was producing a measly 41X. Still, I gotta say them stars looked mighty little and sharp. I was also extremely impressed at how many were resolved in the cluster. M13’s core was grainy, and there were dozens of eensy-beansy sparklers around the periphery when I exercised averted vision. 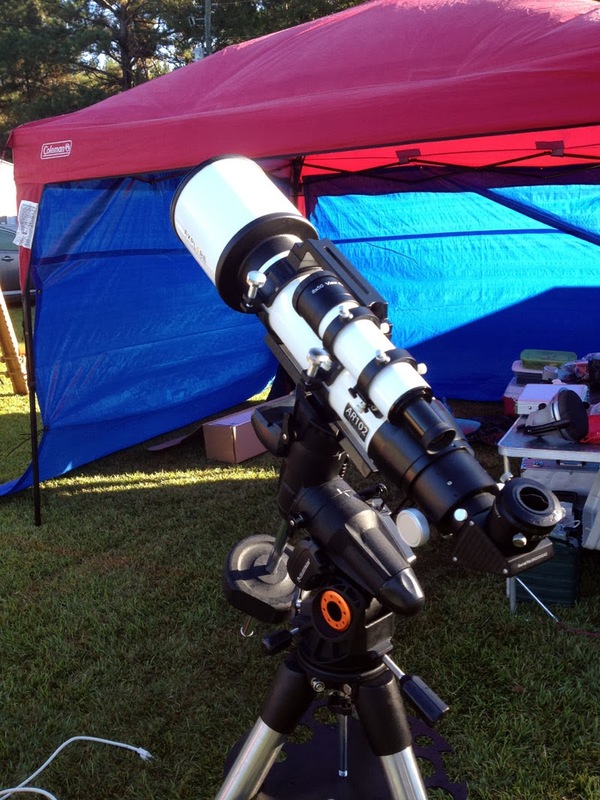 Considerably more stars than I see with our 4.5-inch StarBlast Newtonian. How was the field edge? In the Happy Hand Grenade, stars were acceptable. Not perfect, but okay, and not much worse than in my f/10 SCT. In the Ethoses, they were very good indeed. There is field curvature with this relatively fast achromat, but I never found it annoying. I didn’t notice any other optical problems of any kind. Collimation appeared to be bang-on. The view of M13 was nice, and was considerably better when we switched to the 8mm Ethos (83X), but busting globs is not the strength of a 4-inch wide-field refractor. You go to one for, well, wide fields. While we could, we headed south to the rapidly sinking wonders of Sagittarius and company. They were all tremendous despite their low altitude. The Eagle Nebula in M16 showed up easily; the Lagoon was its purty old self despite being way down in the southwest. The real winner, though, was M17, the Swan Nebula. It looked great, especially with the help of a Lumicon 2-inch UHC filter, in every eyepiece we tried, but for me was best in the Happy Hand Grenade. The Swan was a little small in that ocular, but not too small, and it was swimming in a huge, crazy-rich sea of (yes) tiny stars. We did plenty more showpieces in this early part of the evening, including M22 before it sank out of sight. It’s loose and it’s big and if you want a globular that’s well-resolved and just looks good in a smaller scope, that is it. M20 was easy to see and showed its "petals," a pretty good accomplishment at this time of year. M31? Freaking amazing with at least one dark lane evident. When we'd finished with the Andromeda Nebula, Miss D. was feeling chilled, and both of us were still a little concerned about her “spell” the day before. After a quick look at NGC 457, the E.T. Cluster, who waved her goodnight, she left the field for the Lodge and left her beautiful new scope in Unk’s eager hands. 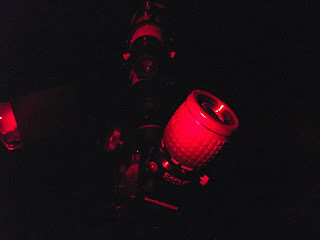 Alpha Lyrae in the field, I took a critical look with all three of my standard eyepieces, the HHG, the 13-mm Ethos, and the 8-mm Ethos. Verdict? Oh, there was color, but it wasn’t nearly as bad as I’d feared. It was noticeable, but when I was critically focused it was genuinely unobtrusive, a small violet halo. No doubt Venus would have been a purple-people-eater horror, but I don’t look at Venus much, and when I do, I don’t use a 4-inch wide-field scope to do it. Whew! Glad we got that settled. What now? More wide-field beauties was the answer, but before I did that, I decided to do a new go-to alignment. I got the correct stars centered this time, including that rascal Fomalhaut. It wasn’t really that hard with the finder—guess my excitement and impatience had been most of the problem—but I am still going to see if I have a suitable red-dot finder for this telescope. Looking up, I saw Cygnus was now straddling the Meridian. What better time to go after one of the more challenging big nebulae, NGC 7000, The North America Nebula? 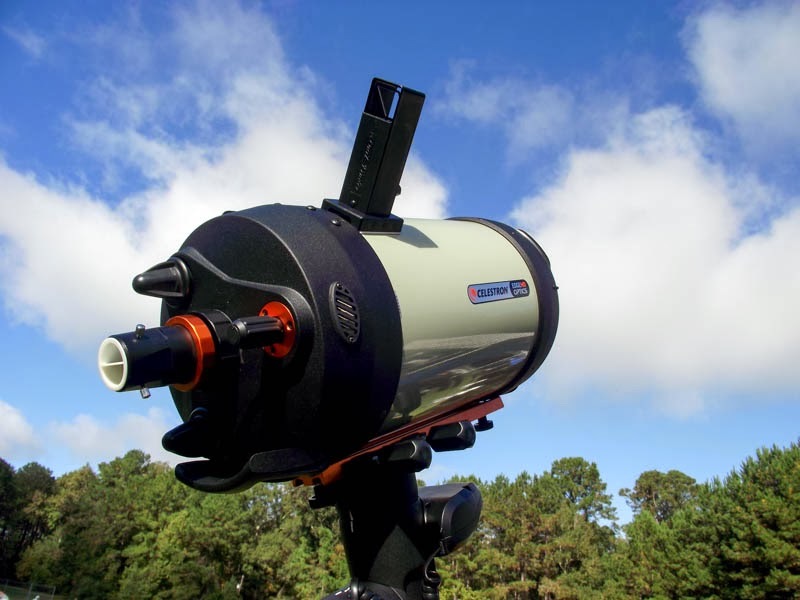 I had good success with it the previous year at DSRSG with the StarBlast, but I was still after a definitive look at that wonder after five decades of hunting for and looking at it. Mashed the buttons, the VX hummed, and we were there. 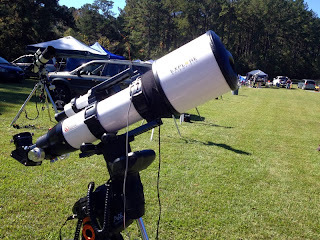 Before having a look, I switched eyepieces, to one of my old favorites, TeleVue’s 35mm Panoptic. I’ve had that ocular for years and consider it a classic, even though I am not usually a fan of lower powers. I will say that when you do need low magnification there is no better way to get it than with a 35 Pan. It is far more comfortable to use than most eyepieces of its focal length. Its eye-relief is not too long, and it doesn't suffer much from “blackout” if your eye is mis-positioned. Alrighty, then, what do we have here? A quick look showed something in the big field, something faintly nebulous twining through the clouds of stars. How about adding the UHC? Good thing Unk’s sneakers were tightly tied; otherwise my socks would indeed have been blown off after I screwed on the filter. There it was. The nebula, and especially the “gulf coast” region, was—dare I say it?—bright. Slewing a little even turned up the freaking Pelican lurking down in the starry Caribbean. No, even at 19X I couldn’t quite frame the whole thing, but it was good enough. Man, was it ever. I have never, ever had as good a look at the N.A.N. This single observation made the whole night worthwhile. NGC 7000 was so cotton-picking good I decided I’d go after its e’en tougher sister over in Perseus, NGC 1499, The California Nebula. I wasn’t quite sure what to expect. It had been visible with the StarBlast and an h-beta filter the previous year, but was not easy. VX hummed, I looked into the Pan, and was soon hollering, “Jon, get over here!” There it was, running down the center of the field as an easy to see stripe of nebulosity. Jon and I scanned up and down the huge thing for a while—we spent the whole evening calling each other over to our AR102s for looks at one wonder after another. Only bummer? If only I had had a 2-inch h-beta filter for the 35 Panoptic. The UHC worked but was not optimum for this deep red object. What impressed me even more than the way the AR102 had shown up the two legendarily dim nebulae? How well the scope’s focuser worked. It never slipped, even with the big Panoptic, and its action was smooth and responsive no matter where I pointed the scope and no matter whether I was using the course or fine focus knob. The fine focus? With a fast scope that tends to snap into focus, it sure is a help. I knew that anything else I’d look at pre-M42 would be a letdown after those two stupendous nebulae, but I had a lot of fun while waiting for M42 to rise above the trees. Most of that fun came from running through the objects in one of Sue French’s “Deep Sky Wonders” columns. Doing “Sue’s objects” is a tradition for me at Deep South, and I thought I’d give her November 2013 column, “Friends,” a spin. Before I could do that, though, I had to zap some dew. I didn't have a 4-inch dew-heater strip, so I made do with an 8-incher, wrapping it around a couple of times. I wasn’t sure how well that would work and, especially, whether it might not get too hot, so I set the DewBuster controller for 5-degrees above ambient. It was humid, but not as bad as Friday, so I hoped that would be enough. The result was the objective dewed-up not long after we left the California Nebula. Luckily, I found I had a 12-volt hairdryer/dew zapper in the equipment case—I initially thought I’d left it at home. I zapped, cranked the ‘Buster up to 10-degrees and had no further dew problems. It had been a long time since I’d spent much time in Cassiopeia. Maybe not since I woke up one morning with the idea to view as many open clusters there as I could for my book The Urban Astronomer’s Guide. So, it was like old home week. Sure I’ve seen M52 and M103 in the interim, but a couple of Ms. French’s other picks were like old friends I hadn’t seen in too long a time. M52. I very much agree with Sue’s description of this cluster, which, like me, she observed in a 4-inch refractor. As she says, it is a “swarm” of fifty or more small sparklers packed into an area of about 15’ diameter. Sue doesn’t mention it, but to me the central area always looks triangular in a smaller scope. I ain’t much on asterisms, so I skipped the next Friend, “the Airplane,” and headed onward to another open cluster, Czernik 43 that is just southeast of M52. It was quite marvelous in the refractor; at low power it looks like a “detached” part of M52 and is equidistant between the Messier cluster and a magnitude 6.6 star 14’ farther to the south-southeast. One of the great things about Sue French’s columns is that she offers up a nice variety of objects each time. Next was a faint emission nebula, NGC 7635, The Bubble Nebula, 30’ to the southwest of M52. 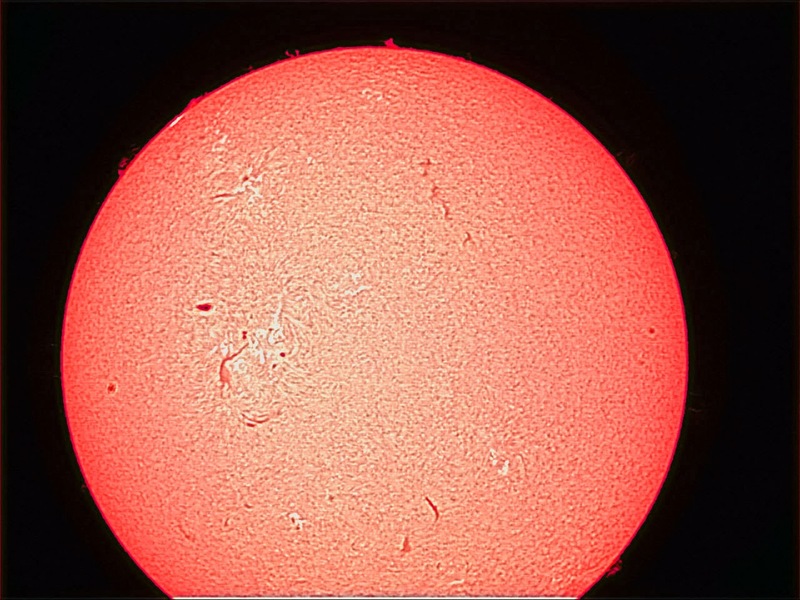 Sue calls it “faint” in her 130mm refractor, and it dang sure was in the 102mm. It was visible in the OIII filter equipped 13mm Panoptic, but just barely as a faint haze. The “bubble,” which had shown itself so starkly in the Edge 800 and Mallincam the night before was nowhere to be seen. That was okay. What I could see, a rectangular swath of nebulosity made a beautiful field even more beautiful, even with the star-dimming caused by the filter. From the Bubble, Sue takes us to a double star. I like double stars, but wasn’t in the mood on this night, so I pressed on to King 20, an open cluster. This little group is mainly distinguished by being near a prominent multiple star system, AR Cassiopeiae, which is 26’ to the west. What I saw was pretty much what Sue French saw: a misty patch of starlight framed by a triangle of dim resolved stars. The tiny, misty stars that form the cluster itself tended to wink in and out as the seeing (which was not ever very good on this night) changed. The last Friends object was, believe it or not, Cassiopeia A, the supernova remnant left over from a supernova (unobserved) that lit-off in the last years of the 17th century (maybe). Sue could see it with a 9.25-inch SCT, but I certainly didn't get a hint of it with the 4-inch refractor. Sounds like a job for the Mallincam. I intended to make it an early night because of that inevitable packing and drive home in the morning-time, but after I’d done the last of Sue’s Friends, M42 still wasn’t quite high enough to look at. I spent the next hour zig-zagging across the sky to a variety of objects. Everything from bright wonders like M2, M1, and M30, to Herschel 400 objects. I was pleasantly surprised that the AR picked up every 400 I tried. Yeah, I know Steve O’Meara did ‘em all with a 4-inch refractor, but I don’t have his eyes or skies. Finally, M42 was well above the trees. I had stuck to the rule my old friend Pat Rochford and I formulated at a long ago DSRSG: “No going to bed till the Great Nebula is good and high.” The greenish color that is sometimes visible was particularly strong on this evening, and even at 41x the Trapezium’s minuscule stars were so well separated I coulda drove a truck through the spaces. The nebula’s glowing clouds just seemed to go on forever. I was so hyped up by the sight of Orion (and maybe the Monster Energy Drink I’d chugged about an hour before), that part of me wanted to stay up for ISON. And maybe even linger through Sunday night. That would have been possible, but there’d have been no supper served Sunday night, and we might have had to move to a cottage. In the end, I decided that, as always, The Only Enemy of Good Enough is More Better (Gooder). After four days at FRC it was time to get home to the Old Manse. Back at the Lodge, it wasn’t quite 2 o’clock, and I spent an hour watching DVDs, surfing the pea-picking Cloudy Nights, and thinking about the 2013 edition of the Deep South Regional Star Gaze. Over the years, there've been good ones and not so good ones, same as with any star party. 2013 wasn’t the best ever—that was 1994, the first year I had my new wife, Dorothy, at my side—but it was a goodun, best in years. Will I be back next fall? Sure hope so. If we do a spring edition, I dang sure intend to be onsite for that, too. Deep South Forever, muchachos. Well, muchachos, another Halloween has come and gone. Believe it or no, your old Uncle didn't get a bag full of rocks this year. I got a telescope full of Arp galaxies. Y’all probably thought I’d forgot all about those little sprites. It’s been dang near ten months since you heard anything about my “next” observing project, the one that came after The Herschel Project, Operation Arp. Which is my quest to observe (mostly with a Mallincam video camera) Halton Arp’s disturbed, weird looking, and otherwise strange galaxies. The reason you haven’t heard anything more about Operation Arp isn't that I’ve lost interest in bagging those distant and sometimes dim galaxies. It is admittedly a less absorbing project than hitting the Herschels was, but that’s not why O.A. has been on hiatus. The reason, as I don’t have to tell those of y’all who observe from below the Mason Dixon Line, has been the weather. The rest of the country has had its share of cloudy nights over the past spring and summer, but the Southland got hit particularly hard. I had two semi-good nights at the Chiefland Astronomy Village last January, knocking off 28 Arps and a passel of Herschels I needed re-image, but that was near about it. The single halfway decent evening I got at the Deep South Regional Star Gaze Spring Scrimmage in May was not good enough for Arp galaxies. There were clear nights here and there after that, but mostly when there was a fat Moon in the sky. The weather situation has finally turned around—sorta. Possum Swamp is still getting plenty of rain—we always do in the autumn—but at least it is interspersed with passing cold fronts that clean and clear the sky temporarily. And it even looked like that might happen during one of our favorite star parties, the Deep South Regional Star Gaze, now held near Norwood, Louisiana. We’ve been doing DSRSG almost every year for two decades, and it’s tops with us for good facilities, good skies, and good folks. 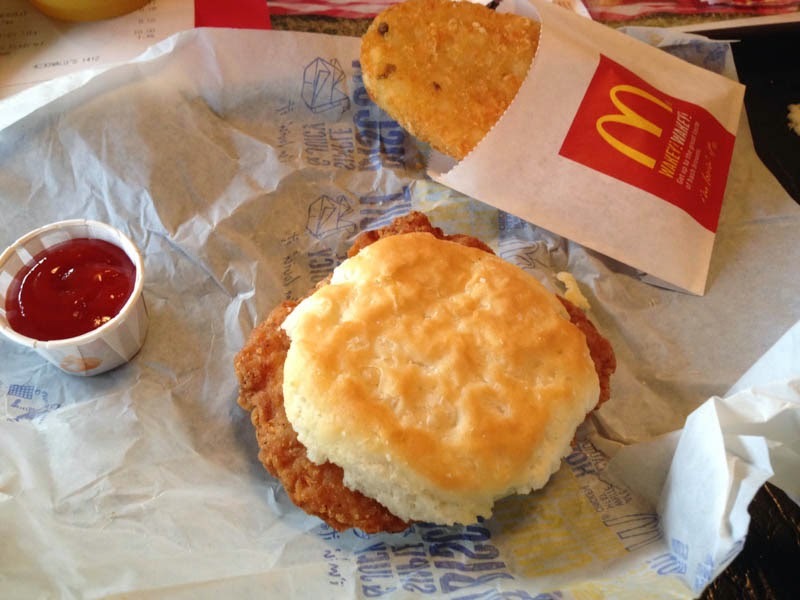 Who doesn't want fried chicken for breakfast? Couple of weeks back, it seemed like the weatherman was gonna cooperate with us for the whole DSRSG run. Wednesday night, October 30, the first night of the event, would coincide with cooling and clearing, and “cool and clear” would be the rule for the whole four nights of the star party. Naturally, that didn't hold as we got closer to DSRSG, but it still looked like we’d get at least two and probably three outstanding nights. Maybe. 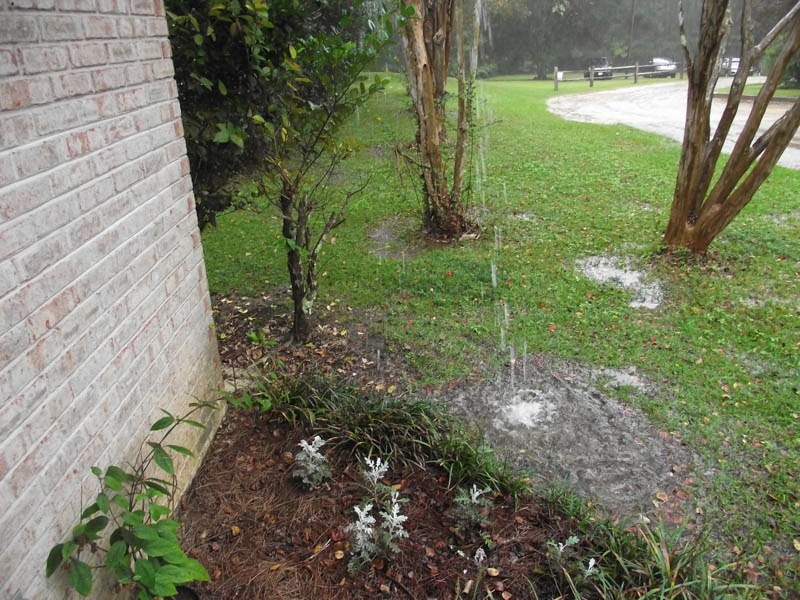 By the Monday preceding the star party, the weather outlook for Louisiana was getting worse by the minute. There’d be zilch Wednesday, Thursday, Halloween night, would be worse with (possibly) violent storms, and Friday, which had looked so good, was now tending to “partly cloudy.” Should we wait till Friday morning to leave? Maybe still go as scheduled on Wednesday but not try to set up on the field that day? After some consideration, we decided to depart Wednesday as planned. 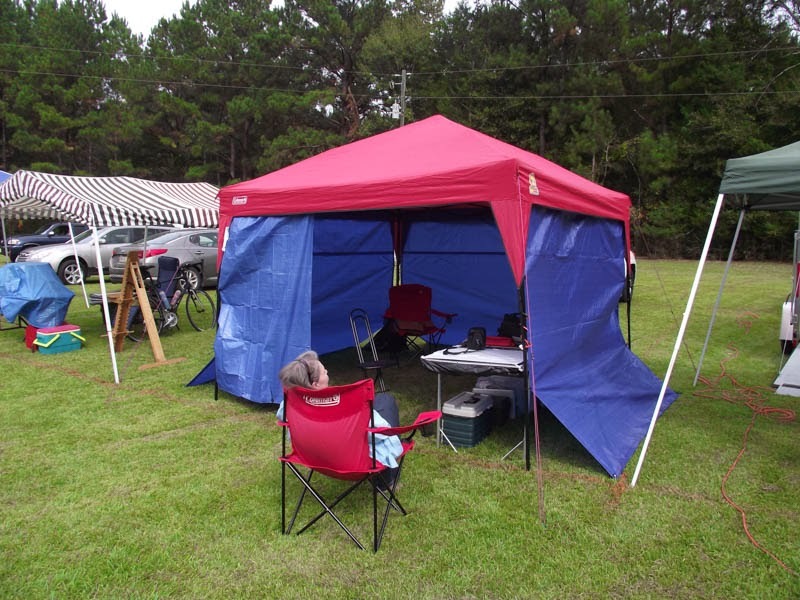 Our meals and lodging were paid for, and, as I’ve often said, we always have fun at a star party clouds or not. Should we delay setting up the gear for a couple of days? That was a possibility depending on how bad the forecasts became. I at least wanted to claim one of the limited number of field power outlets on Wednesday. Tuesday, following a run on Target for supplies that included propane bottles for my Black Cat heater, Jack Links and granola bars for on-field snacking, bottled water, and—natch—Monster Energy Drinks, I got to work loading Miss Van Pelt, our 4Runner. 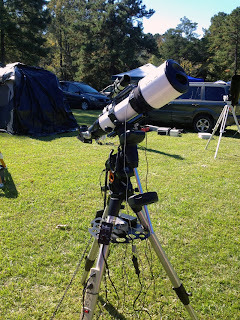 Some time back, I did a blog on star party packing, and in the course of that did some serious cogitating on how best to load the truck. Following my own suggestions from that blog, it was amazing how easily the astro-junk went in Miss Van Pelt this time. Easy or hard, it is fraking wonderful to get the packing done the night before a star party. Not having to face that makes departure morning an absolute joy. The remainder of Tuesday night was spent NOT watching The Weather Channel on cable or looking at Wunderground on the pea-picking computer. What would be would be. Instead, I spent an early evening watching the DVD of World War Z, which I’d missed when it was on at the picture show (I’d call it 75% spectacular and 25% craptacular). That, a few Kolorado Kool-aids, and Unk headed upstairs to get plenty of rest for the big day that would follow. After a fairly restful evening—I really went to bed too early—I was up at 6 a.m. and rarin’ to go. Miss D. was already bustling about. I checked my always copious email, laid out the cats’ provisions, made one last gear check to ensure I hadn’t forgot anything important—I know I am always going to forget something—and me and D. hit the road for the wilds of Louisiana. Well, we hit the road after a stop at the neighborhood (downtown) Mickey D’s where Unk feasted on a fried chicken biscuit as per normal. The just over three-hour journey to DSRSG seemed to go faster than ever before. In fact, it was faster. Our new GPS, a Garmin, which replaced the Tom-Tom some light-fingered miscreant helped himself to, had a new and quicker route planned for us. After you leave I-10, I-55, and I-12 behind, there are miles and miles of two lane country roads to face. The GPS had discovered a new route that cut nearly half an hour off our usual time and was considerably more direct. Afore long, we were turning off at the Feliciana Retreat Center (FRC) sign and driving onto the well-remembered grounds. This was our fourth year at this Presbyterian church retreat (D. and I missed 2011), and it had now assumed the familiar and friendly feel of our previous venues, Percy Quin State Park and Camp Ruth Lee. 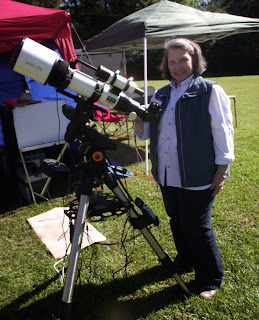 I loved both those places, and especially Percy Quin, where the star party was held from its inception in the 1980s until 2005, when we had to find a new spot post Hurricane Katrina. 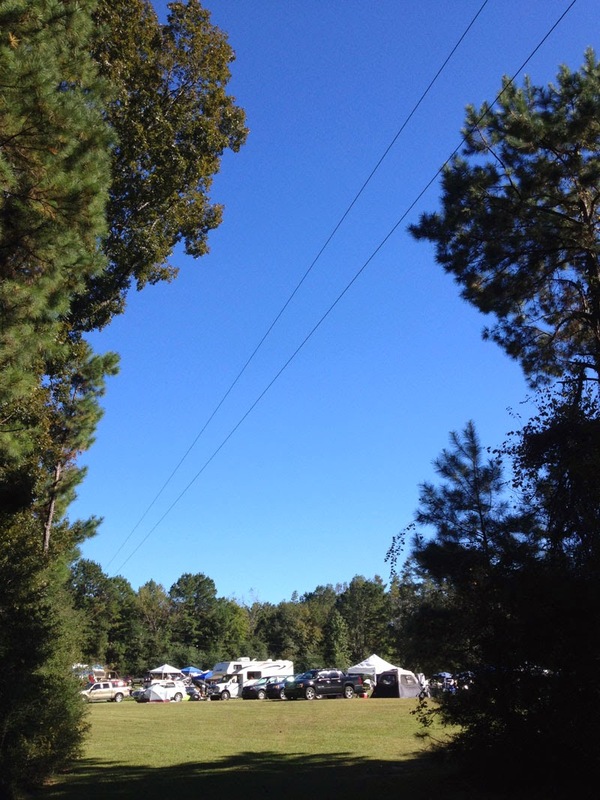 Much as I loved that Mississippi state park, the skies at FRC are better and so are the facilities. In addition to a larger observing field than at Percy Quin with better horizon lines, there are spotless modern cabins (“cottages”) and a Lodge that features small motel-like rooms and a modern dining area that serves amazingly good food. That, campers, is how your old Uncle likes to star party. Gear set up on the observing field was not exactly a joy, but it was bearable. In advance of the storm front, temperatures were kicking up into the dadgum 80s, and it was a little sticky. I was tired and sweaty by the time Mrs. Peel was on her mount and the tailgating canopy was up, and was dang sure glad I’d worn shorts. Miss Van Pelt unloaded, I connected to the field’s power board with the el cheapo 100-foot extension cord I got at the Wal-Mart. What a relief it would be not to have to worry about batteries to run scope, computer, and dew heaters. I power the Mallincam Xtreme off a battery in the interest of obtaining the cleanest video possible, but even though the camera has a Peltier cooler, it is a current sipper. I could probably run it for a couple of nights on its jump-start battery. Over to the Lodge to unpack. 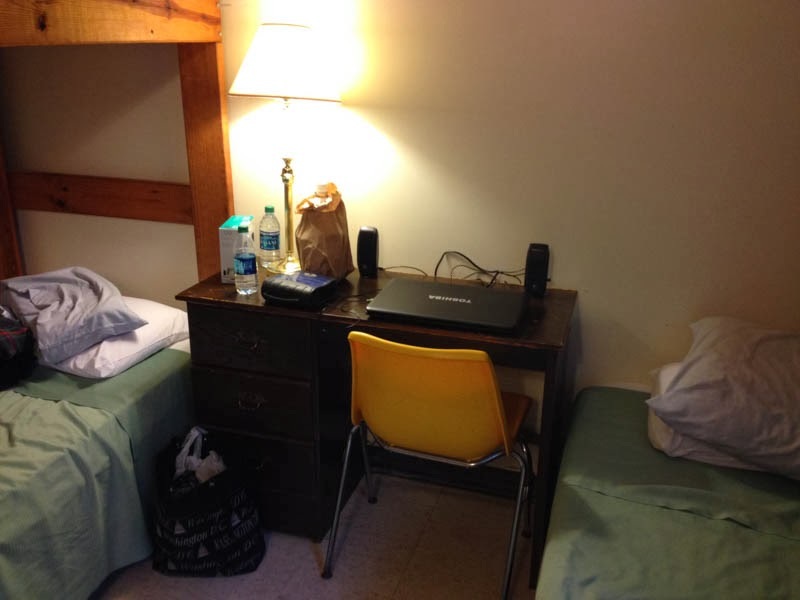 Yes, the rooms are tiny, but they are clean, air-conditioned/heated, and have individual bathrooms. No, it’s not like spending a night in the dadburned Ritz—or even in the Chiefland Days Inn—but it is one hell of a lot better than the dirty, buggy chickie cabins we suffered through at our previous location, nearby Camp Ruth Lee, for four years. What next? We hung out on the field talking to old friends, many of whom we only see once or twice a year, fiddling with the gear, walking about, and just freaking relaxing—which is almost as big a reason to go to a star party as observing is. 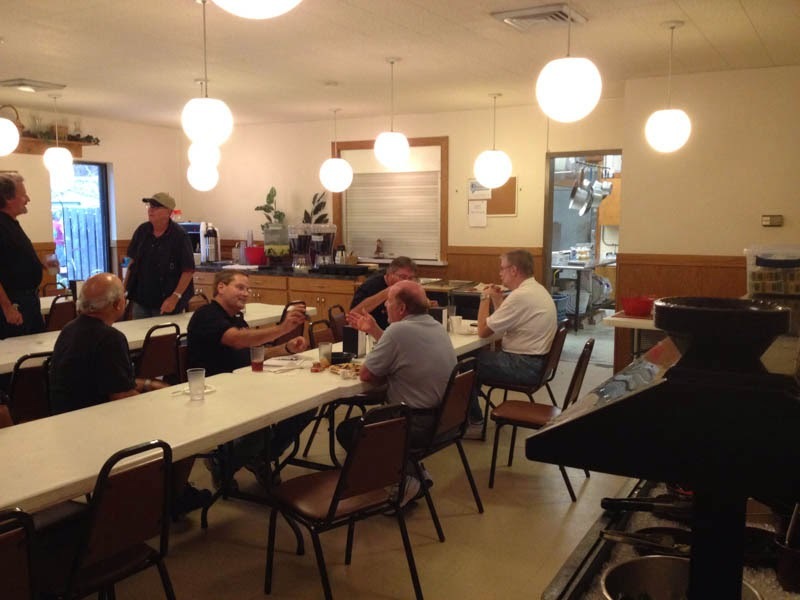 After the first raffle giveaway, where Unk, as usual, didn’t win a thing, it was time for supper. To say the food at Feliciana is a cut above normal star party fare is to way understate it. Not only are the victuals considerably better than the “edible” you get most places, you eat ‘em in attractive surroundings. The traditional first night entree, grilled chicken, is not my fave, but either it had improved this year or Unk was hungrier than normal. I gobbled it up along with a large salad from the (yes) salad bar and a huge hunk of frosting-slathered carrot cake. After the meal, I had two goals: walk off all that food, and take a critical look at the sky. The field is about a quarter mile from the Lodge and the last thing I want is to have to hike out there in the middle of the night in a storm to secure the gear like I had to do in ought-nine. I’d already staked down the tripod of Emma’s VX mount just in case, but if it was evident bad stuff was on the way, I wanted to move anything that might be damaged by rain or wind into the truck. Including Mrs. Peel. I didn’t fancy spending the evening fretting about my beautiful C8, and wind up getting dressed and going out to the field in the middle of the night to pull her off the mount like I did last spring. It didn't take much looking in the sky to see nasty weather was in the offing. Hell, you didn’t even have to look. There was a still, quiet, uber-sticky feel to the air that said, “storm’s a-comin’.” I moved what needed to be moved into the 4Runner, including the C8, and pounded in my tent stakes a wee bit more. Particularly those securing the tarps we attach to the Coleman tailgating canopy to form its sides in cold weather. Following the front passage, temperatures were supposed to fall into the lower 40s, if not lower. After I’d done all I could to prepare for the weather, I spent an hour or three visiting with my fellow Deep Southers on the field. Till the humidity and skeeters got to me. This location normally does not have much of a mosquito problem, even in the spring, but the current conditions were bringing in waves of ‘em. I headed back to the Lodge, where I spent an hour or two looking at DVDs on my laptop, episodes of Star Trek’s first season, including one of my favorites, “What are Little Girls Made Of?” before packing my bags for dreamland. Thursday dawned. Well, sort of. The thick clouds of Wednesday were thicker than ever. I hadn’t been awakened in the middle of the night by thunder-boomers as I had been in the spring, but when I poked my head outside after I’d snagged a cuppa java from the dining hall, it was already sprinkling rain. To top it all off, a look at wunderground.com on the laptop (FRC's Internet access was much more reliable than in the spring) showed we were under a freaking tornado watch. After a traditional southern breakfast (biscuits, sausage, grits) I headed to the field while I still could. Actually, the rain mostly held off through early afternoon, and I was able to spend some time out there with my friend, former student, and Escambia Amateur Astronomers’ Association President Jon Ellard. 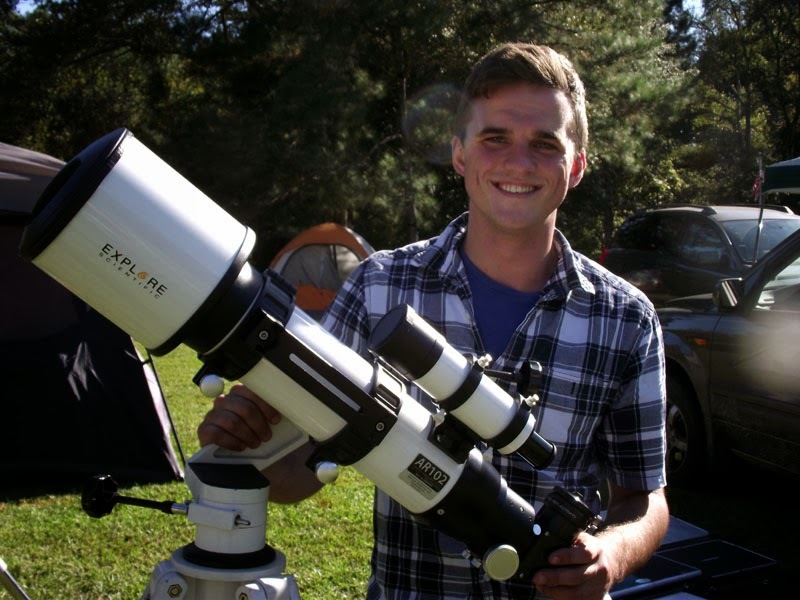 That young man is one of my astronomy success stories, and anybody who thinks amateur astronomy doesn't have a future only needs to look at him and younguns like him—and there are many more of them than you might think. I was also pleased to see long-time Astronomical League figure Mike Benson had arrived. Dorothy and I hadn’t seen Mike since 2003 when he and the Barnard Seyfert Astronomical Society had Unk up as a speaker at that year's Tennessee Star party. Mike was onsite to chair a meeting of SERAL (Southeast Region of the Astronomical League) Friday afternoon, and Dorothy and I were looking forward to that. Udder than that? Thursday was purty much like Wednesday till mid afternoon. Until about two o’clock, when the rain sprinkles came back and this time did not diminish. 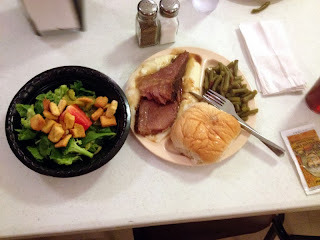 By supper (FRC's legendary pot roast and mashed taters), it was pouring. How did I spend a rainy Halloween night? Jon and I had planned to dress as Obi Wan and Luke and give light saber demos on the field (no, I am NOT kidding), but the wet conditions and lack of kids on Thursday dissuaded us. Next year, y’all. Instead, I watched one of my favorite Halloween flicks, maybe my favorite Halloween movie of all time, The Rocky Horror Picture Show, thanks to a DVD DSRSG Managing Director Barry Simon brought along. Sitting with my buddies watching it on a big-screen TV in the lodge, I wished I had rice to throw. Back in the room, I viewed the DVD of It’s the Great Pumpkin, Charlie Brown like I do every October 31, and was soon dozing off to the sound of rain on the roof. Come Friday morning, I was almost afraid to look outside. Fronts have been known to stall out, after all. Fueled by plenty of coffee, I worked up the nerve and had a peep. The sky was not cloudless yet, but that was obviously the way it was headed. There was a good breeze, and the temperature was in the low 60s or maybe even the upper 50s. That sure perked me up and helped me enjoy a breakfast that was even more southern than before, adding sawmill gravy to the down-home mix. The question Friday wasn’t “What do I do all day?” but “How do I do everything today?” In addition to getting the repacked gear unpacked, the scope back on her mount, and the things that had got wet dried out, there was a presentation to hear, that SERAL meeting to attend, and the first big raffle giveaway’s prizes to drool over. First up was one of the best presentations I’ve heard at a star party in a while, Walt Cooney’s talk on amateur contributions to the science of astronomy, and in particular CCD photometry of asteroids. I don’t normally think of DSRSG as a star party that’s big on presentations; I think of it as being more focused on observing and having fun, but there have been some real good talks over the years. Walt was followed by the SERAL meeting where old and new business was addressed and Unk and Jon were installed as SERAL officers. I have been known to complain about the AL, so it’s high time I put my money where my mouth is and pitch in and help out, I reckon. Only downer? During the meeting, Miss Dorothy began feeling ill and I had to walk her back to the Lodge. I was awfully concerned, since she looked like she might fall out. She was soon feeling better and we attributed her “spell” (as we Southrons call such things) to heat and the sudden change of weather. The meeting hall’s air conditioner was out of whack, and despite the cool outdoor temperatures it was hot in there and awful stuffy. That and the dramatic change in air pressure after the front passage, which played hob with everybody’s sinuses, had conspired to nearly lay D. low, we decided. Miss Dorothy feeling better, the next thing on the agenda was the raffle at 3 o’clock. I often say I never win anything at a star party, but that ain’t strictly true. I’ve had a right good record of picking up little stuff in recent times. I got a cable to allow me to control the telescope with my iPhone at the AHSP this year, and I won a camera mount for the iPhone at the Friday afternoon raffle. 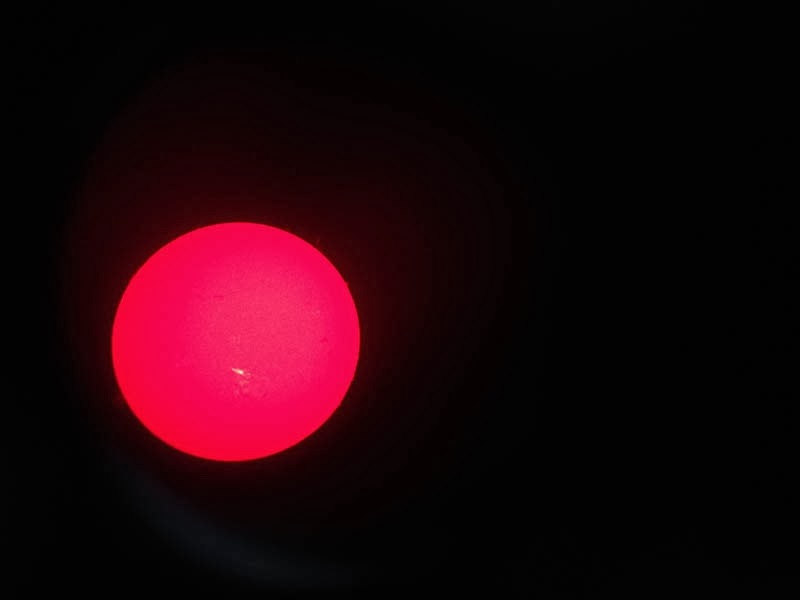 That was cool; I’ve had a lot of fun just hand-holding my phone camera up to the eyepiece, like I did Friday afternoon to capture a cool Solar flare through Jon’s H-alpha scope. But that was small potatoes compared to what Dorothy won. Miss D. has been a consistent winner, but I was still amazed when her name was pulled for a beautiful Explore Scientific AR-102 refractor. Yes, Dorothy had won a big, beautiful telescope. This wasn’t the only big prize donated by Explore Scientific to our little star party, either. In addition to yet another 102, there were several of the company’s fantastic eyepieces. Scott Roberts and his colleagues sure have my gratitude for their kindness and generosity to their fellow amateurs. As I always say, when you need astro-gear, buy it from somebody, support somebody, who supports us. You’ll get a full report on Dorothy’s new telescope and the last day of the star party, Saturday, next week. For now, all I’ll say is her scope looked luscious when I pulled it out of the box to check the ring/dovetail situation and see if it would be likely to balance on the VX with the single counterweight I’d brought along. I was tempted to mount her on the VX right then and there, but Mrs. Peel and the Mallincam Xtreme were ready to go, and I wanted to hit the deep, deep sky hard on this first good night. Supper, which was a somewhat odd but good concoction, fried catfish with a side of shrimp scampi, came and went, the skies held, and soon enough it was time to get the scope cranking. I’d considered several observing projects for this year’s DSRSG, but the only one that had much appeal was the aforementioned Operation Arp. If there’s anything negative to be said about it, it’s just that it is all galaxies, and, since I did so many, many galaxies in the course of The Herschel Project, it would be nice to look at something else for a change. At least the Arps are usually interesting galaxies, so that’s what I’d do Friday night. Before I could see a single cotton-picking Arp, though, I had to get Mrs. Peel aligned. I sure was glad I’d practiced doing the AllStar polar alignment last weekend. For some reason, I’ve shied away from AllStar over the four years it’s been out, and have only embraced it now because I have to use it with the VX; the old firmware with its align-on-Polaris polar alignment will not work. I am happy to report I’ve finally got friendly with AllStar. Did a normal 2 + 4 go-to alignment, chose Deneb Al Giedi as my AllStar star, and it was duck soup, you-all. The resulting polar alignment yielded round stars in 1-minute plus (unguided) exposures. Since it was not dark enough to get started with galaxies right after AllStar was done, I essayed a second go-to alignment. I had moved the mount a fair distance in the course of the polar alignment, after all. Even so, my go-to accuracy would probably have been fine, but since I had the time for a redo, why not? Did a quick series of go-tos to M13, M57, and a couple of other pretties to make sure mount and Mallincam Xtreme were doing their things as they should be, fired up SkyTools 3, and hit the Arp list. Since I’d knocked out less than thirty of the suckers on that winter night down in Chiefland, I had plenty of fuzzies in plenty of constellations to choose from under galaxy-laden fall skies. One difference from that night in Chiefland? I upped my exposure from my customary 14 seconds to 28 in hopes of catching more detail. Ain’t much point in doing Arps if’n you ain’t going after details, is there? “Arp 295” consists two interacting galaxies, PGC 72139, an edge on, and an intermediate inclination companion, PGC 72155, 4’36” to the northeast. PGCs have a reputation for being tough, but these two are in the magnitude 14.5 range and not hard. I couldn’t see the tidal tails that link the galaxies in their POSS plate, but it was obvious the edge-on is disturbed. Arp 15 (NGC 7393) in Aquarius looks very much the same on my monitor as it does on its POSS image, a bright golden center with arms that seem bent back upon themselves. This galaxy was noted for its “detached” segments by Arp. That’s not obvious, but its peculiar semi-ring shape is. Aquarius' NGC 7727 is also Arp 222, a large face-on spiral that is pretty obviously interacting with a smaller galaxy, NGC 7724, which is 12’ to the northwest. Despite a bright background sky to the southeast, I could see a large and distorted spiral arm just like in the POSS plate. Arp 325, which has a quoted magnitude figure of 17.9, is easy to see because the galaxies that make it up are tiny and star-like. They are small enough that it’s hard to tell exactly how many of them there are, but I thought I counted five. These little fellers form an Arp because they constitute a galaxy “chain,” one of Chip Arp’s categories. Not all Arps are 17th magnitude ghosts. There are even a few Messiers among them including good, old M32, Andromeda’s little companion, which is in the catalog as Arp 168. Why it is an Arp is not clear to me. M32 is listed among the Arps with “diffuse counter tails,” but what or where that is, I don’t know. Arp 273 in Andromeda is a strange sight. It’s a confusing welter of spiral arms that seems indecipherable until you realize you are seeing two colliding galaxies, PGC 8961 and PGC 8970, whose skinny arms are nearly intertwined. At magnitude 13.8, this is easy and gives up considerable detail. I liked all the Arps I hit on this night, and I saw some interesting details in almost every one, but for now, I’ll end with one of the most spectacular members of the catalog, Arp 37, another Messier, Cetus’ M77. This bright Seyfert galaxy is not numbered among the Arps for that reason, but because there is a “low surface brightness companion” in the field. What that is, I dunno. The obvious candidate is LEDA 1154903, which is dimmer than magnitude 17, but it is over 10’ away. I couldn’t find the answer to this and some other Arp questions I had on the Internet, so it’s probably time for me to buy Jeff Kanipe and Dennis Webb’s The Arp Atlas of Peculiar Galaxies, I reckon. What will I remember most about this night? Mainly that it seemed so simple. Once the VX was aligned, she didn't miss a fraking go-to. The Mallincam just worked; the only adjustment I made all night was changing the exposure time occasionally. It was all so easy I was amazed at the end of the evening when I toted up my targets and found I’d done about a hundred DSOs including the nearly 80 Arp galaxies. The O.A. score thus far? Including this haul, 105 down 234 to go. “All good things,” they say, and for me that began as the local time display on SkyTools 3 ticked on toward 1:30 a.m. The lower part of the field was beginning to be covered with ground fog, and I figured it would be my turn soon. I was also beginning to feel a little weary. The dampness was sapping my energy even though I was comparatively warm and dry under the canopy with the Black Cat catalytic heater running. Even my second Monster Energy drink of the night failed to fully restore me. I called a halt to the Arps—I’d got most of those high enough in the sky to fool with by now anyway—and had some fun. The funnest of my fun objects? Probably M33. It was riding high and was just tremendous in 1-minute exposures. I’ve rarely seen it look more like the wild-armed spiral it is than on this night. Not only that, it was peppered with red HII regions on my monitor. Its appearance was just magnificent, and is only hinted at in the single-frame grab here. Just before shutting down, I had a look at little Comet Brewington, who at least looked like a comet, if not much of a comet. It had been my plan to stay up for ISON, who would be well up for me by 4:30 a.m. or shortly thereafter, but that was not to be. There was no doubt we’d be socked in-by then. At 2:30, low clouds had indeed closed us down and it was Big Switch Time. I shut everything off, tucked Mrs. Peel in with her Desert Storm cover, grabbed the laptop, and headed to the Lodge. There, I spent equal amounts of time watching a dadgum DVD of UFO Hunters and ruminating on observing projects. I am for sure continuing Operation Arp, but I would like a second and maybe larger project to work on, something with a little more variety. I think I have that project, and will tell you-all about it in due course. As for DSRSG? 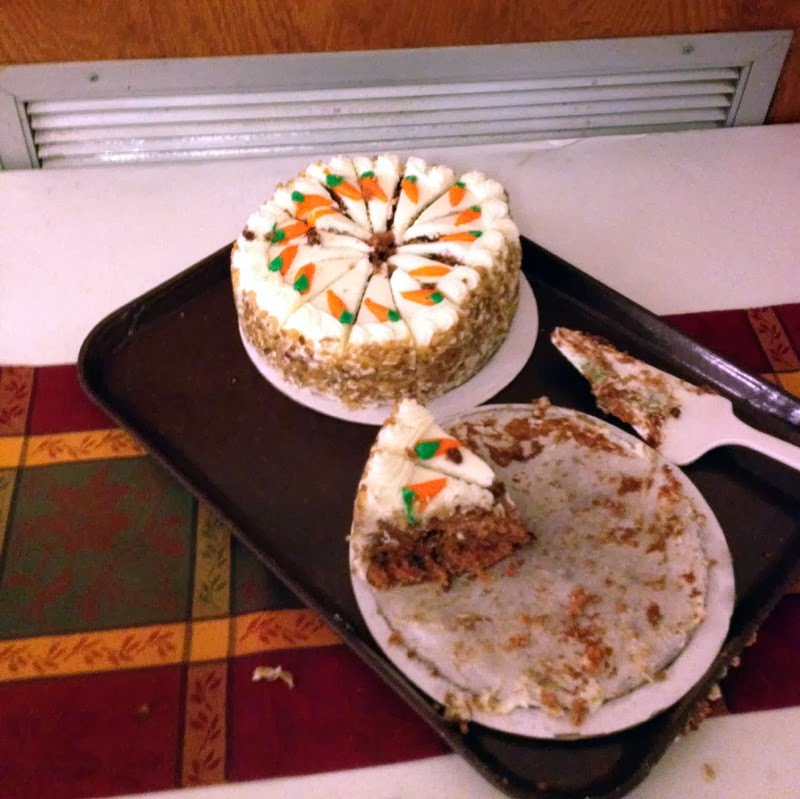 We are out of space and time for this edition of the Little Old Blog from Chaos Manor South, Unk having far exceeded his usual self-imposed verbiage limit. So, we’ll be back at the Feliciana Retreat Center again next week for some time under the stars with Dorothy’s new refractor. Since Unk is not known for his knowledge about or expertise with lens-scopes, it should be “interesting,” to say the least, muchachos. Nota bene: If’n you’ve a mind, you can see lots more pictures from DSRSG 2013 on Unk’s Facebook page.